This past week, a dear friend of mine was in London for a few days. She is an art curator, and I had so much fun hopping around the city seeing it through her eyes. One of our afternoons was spent at the Buckingham Palace State Rooms and the adjoining Queen's Gallery. The Queen's Gallery hosts exhibits of art from the Royal Collection. The Royal Collection consists of art held by the Queen in trust for the nation, instead of being held privately. This year the Queen's Gallery has an exhibit called "In Fine Style," which charts fashion during the Tudor and Stuart eras. Many items of clothing were on display, but we were not allowed to take pictures of the garments. However, the paintings being exhibited were absolutely fantastic! One of the things I was most taken by was the breadth and incredible pieces the Queen has in her collection. 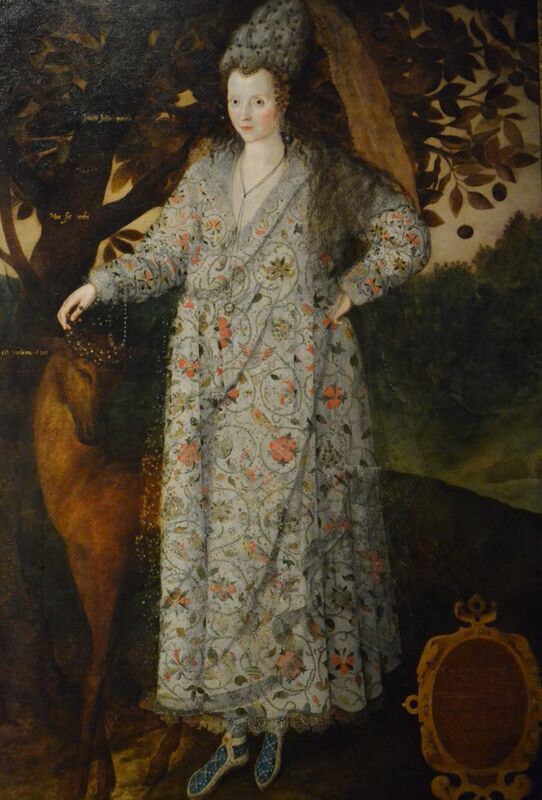 In the above painting we see an early 17th century fashion of wearing exaggeratedly high hair. Women often wore wired structures beneath their hair to maintain the height of the hair and to secure the adorning jewels. The lady in the above painting is dressed for a masque (which was a social event meant to be propaganda for the Royal Court). Her gown and hat are meant to imitate Persian style. Over her gown, she wears a translucent mantle adorned with the equivalent of sequins (which would have been cut individually from a sheet of metal). The effect would have been a dress that shimmered in the evening candlelight. 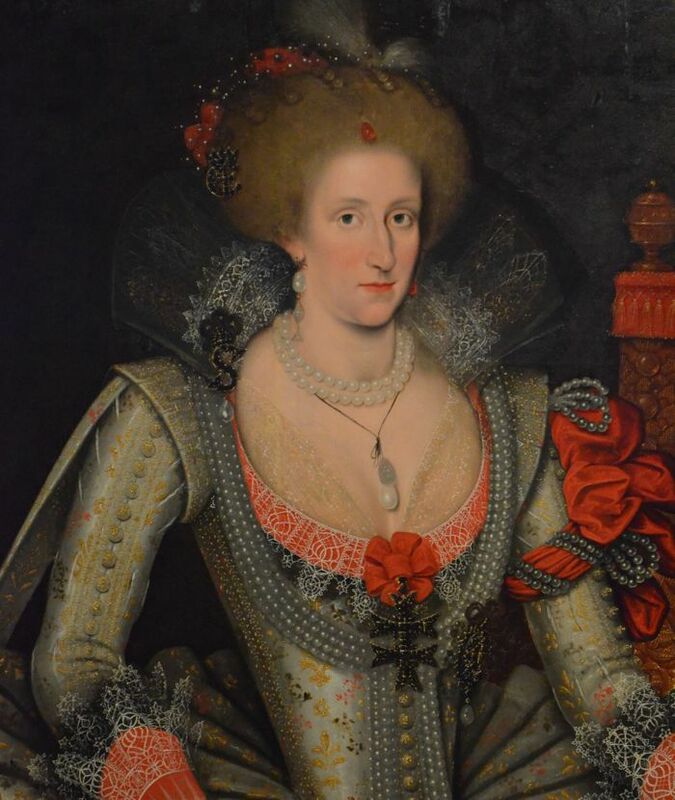 Above is a painting of Queen Anne, King James I of England's wife. 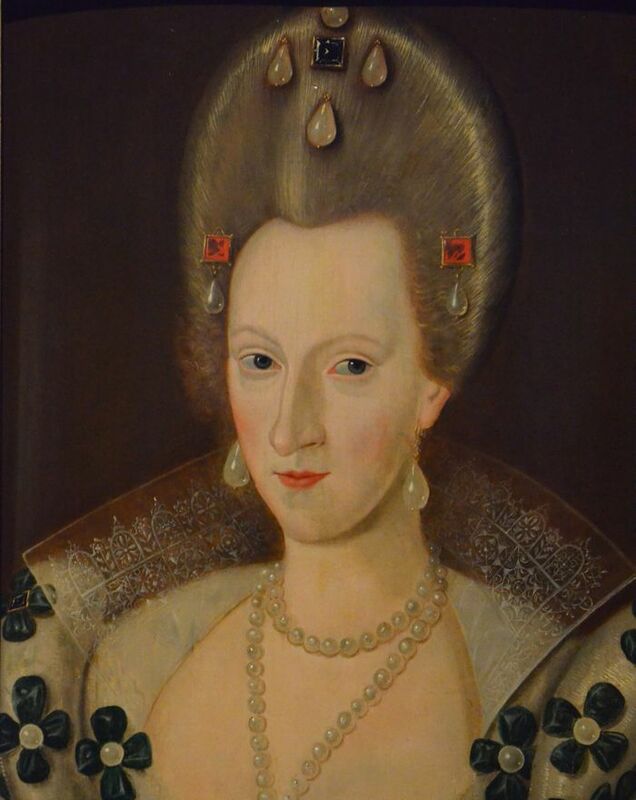 She was Danish royalty and her own lineage was important, even apart from being the wife of the King of England. Consequently, she always wore jewelry that was a reminder of this fact. Above the pearls, crosses and letters on her garment are nods to her personal history. 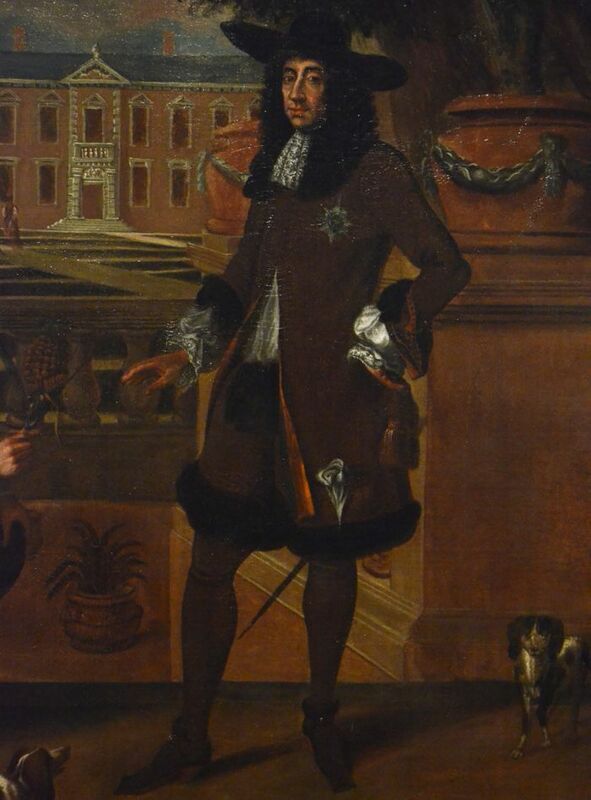 King Charles II is depicted in the above painting. During his reign, he announced a new mode of male clothing which consisted of a knee length vest worn with a coat. This outfit replaced the previous male style of wearing a doublet and a cloak. The King introduced this new look so as to create an "English" style that was not at the mercy of continental fashion whims. Notably, this new type of outfit was the precursor to the modern male three piece suit. Queen Elizabeth I is displayed wearing a gown with sleeves made of a cloth of silver tissued with gold, which could be melted down to release the precious metals. Only royalty was allowed to wear this type of fabric. 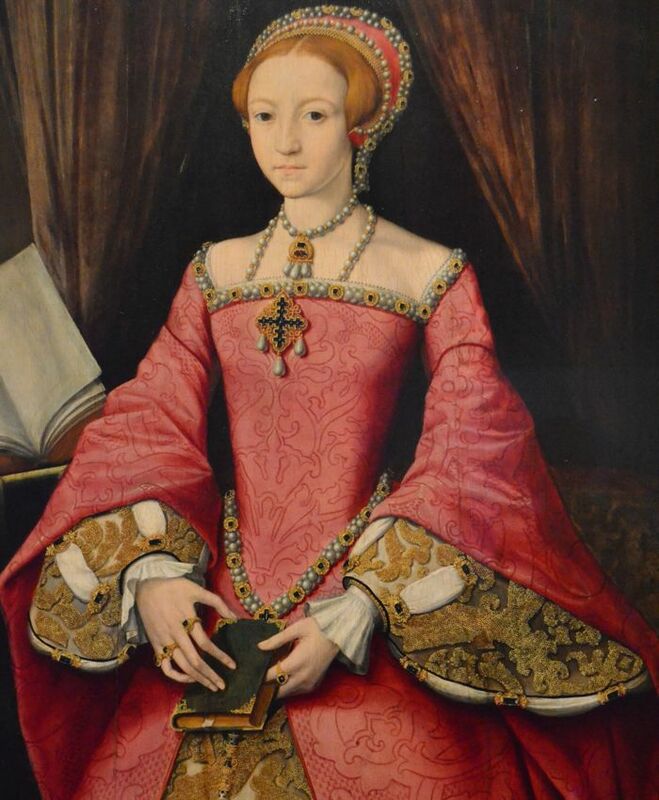 But at the time this painting was created, Elizabeth was considered illegitimate. One of the aspects of the exhibit that I found the Queen's Gallery did exceptionally well was combining the past and the present. With this particular painting not only did the audio guide provide curator commentary about the history of the painting, the audio guide also provided insights from current fashion designer Gareth Pugh about this garment. For an institution such as the Royal family that often seems synonymous with tradition and reverence for the past, it was fantastic to see them seamlessly weave in touches of modernism as well. Above Mary, Princess of Orange, is dressed for a court masquerade likely held in The Hague. I found this garment absolutely striking. Observers during that time described her as being very well-dressed. 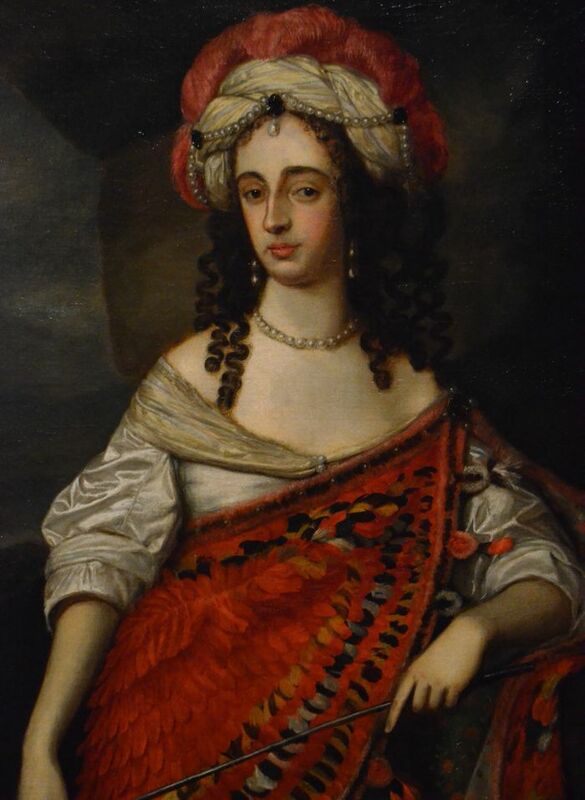 Feathered cloaks like the one she is wearing were worn by the Tupinambá people of 16th and 17th century Brazil and imported to Europe where they were appreciated for their cultural context and craftsmanship. Ooh, I love these tidbits of information! And how fun to go in Buckingham Palace. I've never been, but now it's on my list. The State Rooms at Buckingham Palace are really something to behold!